tvN is on the row, having lately produced great shows after great shows. When I thought their previous show Queen In-Hyeon’s Man did a lot for me, Answer Me 1997 started climbing the charts like crazy. Though it took me awhile to finally sit down with this drama (what with my hectic schedule! )it took just one episode to get me hooked on to it. Luckily for me, all the episodes were already out, and the only obstacle was sleep. The show is about a group of 6 friends – 4 guys and 2 girls, with a couple as the leads where they take turns to narrate. The show kicks of the lead actress going to a class reunion where she introduces her closer friends to us. 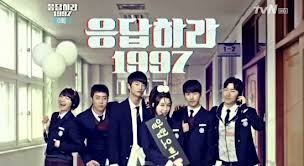 The story evolves into the 1997 after we get introduced to her 4 closest guy classmates when we see them walking in together wearing black suits (flashback to A Gentleman’s Dignity). We get thrown back into 1997, just like what the title says. The show takes the trend of time-traveling and makes this drama a realistic version of it. Who says time travel can’t mean reminiscing the past. Most flashback shows would normally be done along the lines of how the flashback only occurs when they reminisce about that particular incident. In this show, they take it up a notch and weaves the present and past through ideas of ‘who married who in the end’. When the show is in the present, we are told what to look out for, or at least observe, while we watch the past unfold. It’s keeps us guessing and is a very good tactic to keep us watching if we want to know the answer. We got the first answer in the first half (or less) of the show while the 2nd question mark dragged till the end of the show. In getting to the first conclusion, we weren’t really given hints on the way, more like remainders. For the 2nd conclusion, we were given physical clues which I thought was pretty genius. Though at one point, the 2nd answer was practically in our faces, yet they still tried to keep that guessing game going on. Let’s just say that the present caught up with the past a bit too soon. The actors and actresses weren’t exactly famous nor would anyone have guessed they could pull this off. In fact, a few of them were idols, who as I remember, don’t usually do well in their first drama. Eun Ji from A Pink has gotta be my current most respected idol. The girl can sing damn well (as the lead vocal of A Pink) and in this show she was just so lovable. She made me totally believe her character, I mean, no one can be that in-character! According to her, her accent is that strong and authentic because she was always listening to her elders talk. And who said Saturi (accent of people who do not come from Seoul but other parts of Korea) wasn’t cool. I can almost see it becoming a trend (hahah.. Maybe not). The camera work was pretty good, seems that tvN is really putting more efforts than the likes of local channels. All in all, this has gotten be one of the must watch of the 2nd half of the year. I definitely feel more excited watching this than some other currently airing dramas. The ratings definitely serves as evidence to that! I hope you give this show a chance if you haven’t, and of you just started, look forward to the rest of it!